Kitchens Are Monkey Business: A Night In Japan - At The Saltbox Café. The Hawthornes have had the pleasure of attending The Saltbox Café's around-the-world multi-course wine and dinner series. Chefs Amanda and Randolph Sprinkle pick a country and each wine is paired with a course significant to the region. Tonight, we are going to Japan. Chef Randolph Sprinkle was immediately at our table to personally greet us. He's quite the butterfly about taking care of his customers. He's at every table several times throughout the night, chatting with us and getting a feel from the group. He questions us and it's obvious that he's truly interested in our input. Randolph, know that everyone appreciates this. You make us all feel special and welcome. As for the service, April Wolf and Mike Dinkle are on top of everything, as always. It's such a pleasure to be waited on by these two. Their attention to detail is spot on. More importantly, they make you feel like, dare I say, "family?" Certainly, not Hawthorne Family, thank God, but Saltbox Family, which is a good thing. Of course, I had to ask Chef Randolph about the markings on his hachimaki. Sorry, I don't read Japanese. Randolph told me it meant "chef." Chef Randolph, when I looked up "chef" in a Japanese to English dictionary, it translates to "Shefu." Now, I don't know about you, but "shefu" sounds like a word that could be bandied about the kitchen with a certain degree of risk along with a certain connotation. I must ask you Chef Randolph, has anyone on the Saltbox staff told you to "Shefu?" I can just hear it now, "You want me to do what??? Shefu San!" You know, I'm having entirely too much fun with this. Now that I think about it, Randolph told me Amanda got the "Chef" design for his hachimaki. Hmmmm... If this is true, Amanda would have known about the Shefu. Heheheh! Well played, Amanda! Well played! The Saltbox crew is hard at work plating our first course. Kerry, of Tryon Distributing, introduced each beverage and encouraged us to try the wine or beer both by itself and with the cuisine it's paired with to see how the characteristics of each selection will meld or marry with the course. Our first wine was an effervescent Ozeki Hana Awak (Junmai Sparkling) sake. Slightly sweet and crisp with a floral bouquet, this was a very approachable rice wine with only 7% alcohol (Most sakes fall within 14 -16%.). Our first course was a deconstructed tuna roll, with marinated local tuna, cooked, sushi rice, pickled fresno peppers, and house-made furikake, a mixture of roasted nori and sesame seeds, served on a schmear of wasabi. Our next sake was Tozai Snow Maiden (Junmai Nigori), dedicated to Enako, a famous Japanese koi who lived to the rip age of 226 in the mountain streams where this sake brewery is located. Supposedly, the purity of the water contributed to the koi's longevity. Why is this sake different? This is a Nigori sake which means it's unfiltered. During production, when they actually ferment the rice, they do not filter out the particulates, so it has a creamy texture. This sake is also unique because it's a Junmai Nigori. Junmai, in sake terms, means that the wine is very pure. It's made just from natural ingredients - rice, water, the natural yeast in the brewery, and koji, a beneficial mold that makes fermention possible. Sake is brewed like a beer. The only difference is that rice cannot be malted. In beer-making, you malt the barley so you can extract sugar from it and then turn the sugar into alcohol. Enzymes within the barley help break down starch molecules and convert them into sugars. Rice does not contain the kinds of enzymes that barley does, so an additional ingredient is needed to help convert the rice's starch into sugar. The way the sugar is extracted from rice is by an ancient method of using koji mold. The mold is able to extract sugar from rice which is then converted to alcohol, in this case, about 14%. Some believe that the first alcohol made in Japan was kuchikami-no-sake (chewing in the mouth sake), made by chewing grains and spitting them into a pot. The enzymes in saliva helped to break down the starch in the rice, so the mixture in the pot would eventually ferment. The resulting image isn't exactly appetizing, and there was no sake boom as a result of kuchikami-no-sake. It wasn't until the period of the Asuka rule (from 538 to 710) that koji-kin came into play. Koji-kin is a mold that's commonly used in Chinese, Korean, and Japanese culture to ferment soybeans as well as to make alcohol. Its scientific name is Aspergillus oryzae. There are many varieties of koji-kin, but Japanese sake is almost always made from yellow koji-kin (the greenish-brownish-yellowish mold seen above). To convert sake rice into sugar that can be fermented, koji-kin is delicately distributed over steamed sake rice in a very hot, humid room. Over a period of 48 to 72 hours, the mold is carefully cultivated to grow evenly onto the sake rice. When the "moldy rice" is ready to be incorporated with the other elements of the sake, there is a noticeable, sweet chestnut-like aroma coming from the rice. To the naked eye, each grain of rice appears to be coated with a white frost. As for the sake itself, I was told, "You will notice creamy, nutty tones, along with honeydew and bananas. It is very interesting to have a rice wine with all these fruity characteristics." OK - that's what I was supposed to discern. During the presentations from Kerry and Chef Randolph, I'm always back in the kitchen shooting pictures so I don't hear what's going on outside. I keep a recorder going at the table so I can listen later and regale you with these stories after the fact. I remember going back to my seat, taking a swiff of this sake, and blurting out, "Holy cow! This smells like fish!" How's that for a nose? I hadn't even heard the koi story yet! In spite of the piscean aroma, I still tasted it. Thankfully, it did not taste like fish. This was not my favorite sake. I'm sure I didn't taste "creamy, nutty tones, along with honeydew and bananas" either. I know I've killed a few taste buds along with a spate of brain cells over the years, so that's to be expected. This second course was my favorite and I must recreate it. Chef Randolph describes this as "Shrimp Toast No Toast." It is amazing. It is a surimi of shrimp and scallops with fresh ginger and scallions rolled lightly in panko breadcrumbs and fried. I'm thinking Chef Randolph mentioned a pear salad here with yuzu vinaigrette, but on my recording all I heard was Mr. Hawthorne jibbering excitedly about the three frogs on the window eating their dinner. Edited for clarification: The frogs were on the outside of the window, not inside. Our beverage for the third course was a lovely jasmine green tea. This was paired with house pickled vegetables - a crispy daikon, carrot, and star anise salad, spiced cucumbers and shaved purple onion, with baby arugula with green tea and lemon vinaigrette. Quite refreshing. And the tea was soothing. While I'm in the way shooting pictures in the kitchen, Kerry is explaining about our fourth beverage - a ginger beer (not the soft drink variety). It's a Pilsner (Lager) style beer made with fresh ginger, rice, and sorghum. Said to be "unique and quite delightful." Tasted like beer-flavored ginger to me. From Chef Randolph: "When we were doing our research, we found out that, in Japan, anything with four legs was considered unclean and not edible, with two exceptions - rabbits and ?" Chef Randolph, I couldn't understand what you said for the second animal, but it sounded like you said "ducks" and I know ducks don't have four legs. Then I vaguely heard something on the recorder about Okinawa and how they love pig/pork, so I guess you said or meant pork since we're having a ginger and lemongrass braised pork shoulder for our fourth course with star anise, cinnamon and ginger on top of buckwheat noodles, with stir-fried vegetables, bok choy, cilantro, lime, basil, garlic, soy, and mirin and a really, really rich pork stock. The technique for the pork, besides braising, involved borrowing something from Mexico - carnitas, where you take a cooked piece of meat, already nice and soft and drop it in a deep fryer. Enjoy the textural differences of the meat, the noodles, and the oh-so-rich sauce. I hope Chefs Sprinkles don't notice when I occasionally swipe something off a plate. This is a well-oiled team. Everything is so calm in the kitchen. And they're serving 31 people tonight. Our fifth course - tea-smoked (Black Oolong and orange peel) duck breast atop miso/lemongrass/toasted sesame oil Napa cabbage, finished with a garlic/ginger sauce, was served with Mukune Root of Innocence Sake (Junmai Gingo), named after an ancient village just outside where this brewery, found in 1826, is located. Again, this is Junmai, meaning very pure, made from four natural ingredients - rice, water, yeast, and koji. Along with that, this is classified as a Junmai Gingo sake. You have to mill your very high-quality rice away at least 25% (Or did Kerry say 45%?) Basically what happens is the rice kernel turns very brown and smooth, giving away a lot of the impurities, leaving behind the essential starches, so it becomes an even more pure sake than just a normal Junmai. This is a very pure, high-quality sake. In fact, only 2.6 - 3% of all sake made in Japan falls into this quality category. Tasting notes: "You'll notice this is quite delightful. Classy (Or did Kerry say "Glassy?") It does have a bit of a spicy white pepper character. Subtle. Not too much." Next, Randolph is out and is cozying up to the idea of warm sake because it sweetens it just a little bit and brings out a bit more of the essence. You get more alcohol in there and more flavor. Now I'm in the kitchen and shooting plates of delectable duck and lo and behold, I run into SWORDFISH! I had to ask Chef Amanda about this and they happened to have a pescatarian in their midst. Also a gluten allergy as well. And Chefs Amanda and Randolph rose to the occasion to accommodate their customers. This is a well-thought out, planned menu, and they allowed dietary substitutions. That says a lot to me! As I mentioned, I don't know what's being officially presented because wine-guy and Randolph are out introducing the pairings and I'm shooting pics in the kitchen. I tasted the microgreens and I thought I tasted cilantro. That's when Rosie threw down her napkin and stormed into the kitchen demanding to know if Chefs Sprinkles had a new cilantro purveyor I didn't know of. I believe I might have called them a name. "Cilantro ho" comes to mind. NOT TO WORRY. Randolph calmed me down and told me those were wasabi greens. They really didn't cheat on me and find cilantro elsewhere. Note to self: Self, plant wasabi microgreens next year. Now I'm thinking this is my favorite of the night, the dessert, not the Shrimp Toast No Toast. It's a toss up and the funny thing is I don't care that much for bananas. Rosie gets distracted when she sees pretty, shiny, and colorful. 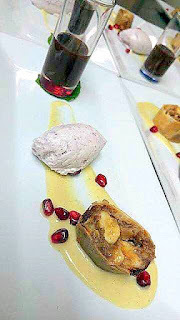 This is a spiced banana spring roll with a mango/ginger/flaked coconut sauce and hibiscus/lemon grass whipped cream with a dark chocolate shooter. I was so excited shooting all the pretty, that I totally forgot all about the shot of dark chocolate ganache. "In Japan, plum tree flowers are known as the blossoms of peace, so Tozai sake-makers made Blossom of Peace premium plum sake. This is different. Most plum wines out of Japan are made from fermented plums and are usually quite dark. This is really special. This is actually made with ultra premium sake and it's blended with the ripest green Adoni plums. These are actually soaked for three months. Very very balanced. Not cloyingly sweet. Tastes of almond and also some cherries. It's really quite nice and a fantastic way to finish the night..."
It's hard enough to hear the recording and then damn if Mr. Hawthorne doesn't come in again about those frickin' frogs on the window so I missed every other word. This is Mike's pic of the dessert. Good to know Dinkle had my back with his picture! Oh my. I gotta recreate this dish too. Chef Amanda made a spiced banana spring roll, served with a shot of a dark chocolate ganache. The cream was steeped with fresno chilies, ginger, coconut, and lemon grass overnight. Underneath the spring roll is a mango/ginger sauce and then the little pink mound is the hibiscus whipped cream. With pomegranate seeds. A perfect ending to an exceptional meal. Here's the wonderful Saltbox Team - Chef Amanda, Chef Randolph, April, and Mike. I love it when a restaurant inspires me. Thanks, Sprinkles! After your Japan dinner, I am inspired to make shrimp toast (which I've never been able to do properly) and I'll try to recreate Amanda's heavenly banana dessert. I'll let you know if I'm successful, otherwise you won't hear a word outta me. The Saltbox Café's next Wine Dinner will be December 7 and 8. They will be featuring a "Reveillon" dinner (from the French word meaning "awakening") which is a traditional Christmas dinner held in many French influenced cultures, particularly New Orleans.